Last week of Farm Store and Week 1 of 4 for the Late Fall CSA! Frosty carrot tops mean sweet roots! It was classic fall weather last week for the final Main Season CSA pick-up, with frosty mornings and warm sunny afternoons! We took spent cold mornings cleaning up and organizing storage crops, while afternoons were spent taking advantage of the warmth to harvest and pull plastic as well as seed cover crop in newly cleared areas. We are gearing up to do more of the same this week, in addition to getting ready for the first pick up of the Late Fall CSA Thursday, October 25th. Pick ups for the Late Fall will be Thursdays 11am-6pm and Saturdays 9am-3pm. This week is the last week of our Farm Store. We will be open regular hours Tuesday-Friday 11am-6pm and Saturday 9am-3pm. Now is the time to use up your 2018 Barrett’s Bucks as they do not carry into next season. We will also have bulk order forms available for those of you who would like one last opportunity to stock up before the winter. Forms will be due November 10th for pick-up November 17th. Forms turned in this week may use Barrett’s Bucks for payment. Rutabaga - After years of failed germination we finally have rutabaga this year. Rutabaga are a root crop that can be roasted, boiled, or used in soups. They are similar to turnips but with a creamier texture. Honey Nut squash- transitional. These small sweet squash look like mini butternut. We are trying them for the first time this season. Let us know what you think! Sweet potatoes - transitional. We have quite the variety of sizes (read: giant potatoes!) but all taste equally good! They have a traditional orange flesh and sweet flavor. Coming up in later weeks of the Late Fall CSA: KN-Bravo radishes (purple daikon), black futsu squash, turnips, watermelon radish, shallots, onions, spinach, lettuce, Peter Wilcox potatoes, Elba storage potatoes, kale, popcorn, and mini daikon radish, as well as more of many of the crops available in week 1. This is the last week of the farm store for the season which means it is also that last week to use your 2018 Barrett’s Bucks. We will have most of the veggies listed in the CSA available as well as acorn squash, delicata, buttercup squash, and onions. We also have some decorative items still available: our own gourds and corn stalks, as well as jack-o-lanterns from Verrill Farm. We will also have Fat Moon mushrooms, honey from Double B, raspberry infused vinegar from Silferleaf farm, pastured eggs from Pete and Jen’s, and the last of the organic cranberries from Fresh Meadows Farm in Carver, MA. Steam the sweet potato until soft, then drain in a colander for up to an hour. Meanwhile, whisk the sauce ingredients until smooth and set aside. In a mixing bowl, work all the fritter ingredients by hand - it should be sticky, so if its a little runny, add some flour. Melt some butter in a nonstick pan. Use a tablespoon to put mix in the frying pan and flatten slightly with the back of the spoon. and fry on moderate heat until you get a nice, brown crust, turning as necessary - about six minutes. Place between two sheets of paper towels to soak up the excess butter. Serve hot or warm, with the sauce on the side. Janel, Lise and Rebecca head back out of the field after covering lettuce for the late fall. In case anyone was unclear about what season it is, the past few days have made it abundantly clear that we are in the midst of fall! We had our first frost on Sunday morning, though the damage appears to be limited to two beds of peppers and a few eggplant tops here and there. A true killing frost appears to be in store for us in a couple of days, so we are planning to completely pick out our eggplant and peppers early this week. It was a pretty abrupt shift - we have become used to overnight lows in the 50s and upper 40s, but this week there are several nights forecast to be in the low 30s! For those of you participating in the Late Fall CSA (October 25th - November 17th) or shopping in the store for the next two weeks, don’t worry! Though plant growth has slowed dramatically, there are still plenty of crops that can hold up in the cold for a few more weeks. In fact, cold weather improves the taste of many crops like carrots. Plants start converting starches to sugar in order to keep their cells from freezing, thus resulting in sweeter veggies! Many of the veggies we eat in the late fall (like sweet potatoes, onions, garlic and winter squash), have been harvested and cured earlier in the season, so they are already safely out of the field and in storage. More tender crops like lettuce are tucked under row cover to give an additional couple of degrees of protection from the increasingly cold nights. For those of you who aren’t part of the late fall CSA, we still have a great week planned, and the store will still be open with many late fall crops until October 27th. We are looking forward to seeing you all in the next couple of weeks before we take a breather and begin planning for next season! Last week, we finally had time to plow and seed cover crop at the South Corey Meadow on Barrett’s Mill Road. We are so excited to start growing in this beautiful spot in future seasons! Sweet potatoes - we grew a small crop last year for the Late Fall CSA and they worked out so well that we grew enough to distribute even earlier! Transitional. Romanesco cauliflower or broccoli - Romanesco cauliflower is one of our favorite fall vegetables. They have a really unique fractal-like appearance and they have a nutty flavor too! They are a little finicky to grow and it varies widely every year when they are ready, but we generally expect them in late October for the Late Fall CSA. This year they are starting to head up in time for the last week of the Main Season, so there will be a choice between cauliflower and broccoli this week. (Our second broccoli planting is also suffering from alternaria, but looks slightly better than the first one). Radishes - there will be a choice between traditional red cherriette radishes or mini daikon, which were a big hit early in the season. Fennel - we take a break from fennel in the summer, but we have a fall planting to enjoy this week. Transitional. Cabbage - we’ll still have savoy, as well as purple cabbage and a green storage variety. Arugula or salanova - we’ll likely only have salanova on Tuesday and arugula the rest of the week. We had difficulty with lettuce germination in August, which is creating a shortage of both salanova and head lettuce right now. Later plantings did much better and will hopefully size up in time for the later weeks of the Late Fall CSA. Picking is pretty much done for the season, though there may still be some herbs available early in the week. We will have most of the veggies listed in the CSA available as well as acorn squash, delicata, shallots, and spinach. We also have some decorative items still available: our own gourds, corn stalks, and flowers (at least for the beginning of the week), as well as jack-o-lanterns from Verrill Farm. We’ve also got mushrooms (shiitake are back!) from Fat Moon, honey from Double B, organic raspberry jam and raspberry infused vinegar from Silferleaf farm, pastured eggs from Pete and Jen’s, and organic cranberries from Fresh Meadows Farm in Carver, MA. 1) Put on a pot of water to boil, and place a colander in the sink. Meanwhile, trim and halve or quarter the sprouts (unless tiny) and add them to the water when it boils. Let them simmer for 3 to 5 minutes--or until mostly tender-- and then drain them thoroughly in the colander, shaking them dry. 2) Place the cranberries in a large (10- to 12-inch) skillet on the stove, and turn on the heat to medium. Cook them solo for 2 minutes, then stir in the olive oil and shallots. Keep cooking, stirring occasionally, for another 5 minutes, or until the cranberries begin to pop. 3) Add the drained Brussels sprouts, plus the vinegar, sugar, maple syrup and 1/2 teaspoon salt -- and toss to combine. Reduce the heat to low, and use tongs to arrange as many of the sprouts as your patience permits cut side-down, facing into the cranberry mixture. (This will color them appetizingly, in addition to saturating them with flavor.) Cover the pan, and cook for another 10 minutes -- or until done to your liking -- stirring from time to time to rearrange the sprouts. 4) Adjust salt, if desired, and add pepper to taste. Serve hot, warm, or at room temperature. We are never sure what our sweet potatoes look like under all those vines and plastic mulch before we start to dig them up! After a successful small trial of sweet potatoes for the Late Fall CSA last year we ramped up our planting and were happy to find a bountiful harvest when we started digging last week. We can’t help but show off particularly large or funny shaped sweeties as we harvest - more than one has been used for a “telephone call” as we spend hours digging with trowels hunting for the cluster of potatoes beneath each plant. After harvest the sweet potatoes are stored in our greenhouse and kept at a high temperature (ideally around 80 degrees) to cure. They aren’t sweet yet but after a week in hot humid conditions the starches will turn to sugars and they should be sweet and tasty! We are finishing the sweet potato harvest this week while the first batch cures and we will have sweet potatoes in the Main Season CSA next week as well as in the Late Fall CSA. If you’re not sure if you’ve signed up for our Late Fall CSA ask the shopkeeper this week. We will have it noted on the CSA check-in sheet. We will also have renewal forms in the farm stand for pick up this week! We are looking forward to the 2019 season - it will be our sixth year here at the farm! Be sure to read the accompanying letter for details about the CSA options for next year. We’ll have Barrett’s Bucks forms for 2019 available in the stand this week, and sign ups for both the CSA and Bucks are also available online! You can also read descriptions of the CSA Options online. Next week is the last week of the Main Season CSA (last pick up day is October 20th). Shallots - Shallots are related to onions but are sweeter with a bit of garlic flavor. This makes them great diced into salad dressings or cooked. Transitional. Brussels sprouts - We harvest the entire stalk of the plant. When you get home remove each sprout from the stem to store in a bag in the fridge. Peter Wilcox potatoes - These purple skinned potatoes are one of our favorites! The flesh is yellow on the inside and they store well. Decorative gourds - Just for fun, not for eating! Transitional. Cabbage - Tendersweet and savoy. Peppers - Likely the last of the peppers as a frost is predicted this coming weekend. We will have most of the veggies listed in the CSA available as well as buttercup squash, delicata, kale, onions and decorative corn stalks. We won’t have corn anymore this season, but we do now have jack-o-lanterns from Verrill Farm. We’ve also got mushrooms from Fat Moon, honey from Double B (produced by bees right here on the property! ), and Silferleaf Farm’s raspberry jam and raspberry infused vinegar. Eggs from Pete and Jen’s are back in stock and we now have organic cranberries from Fresh Meadows Farm in Carver, MA. Preheat oven to 425 degrees. Grease a sheet pan with non-stick cooking spray. In a large bowl, whisk together 3 tablespoons of the olive oil, sriracha or harissa, and cumin. Add the chicken thighs and potatoes and toss to coat. Spread on the prepared sheet pan in a single layer. Season generously with salt and pepper. Roast 15 minutes. Meanwhile, toss the chopped leeks with half of the lemon zest and some salt and pepper. Remove the chicken and potatoes from the oven and toss the potatoes lightly. Top with the leeks. Roast for an additional 25-35 minutes or until a thermometer inserted into the thickest part of a chicken thigh registers 155 degrees F.
While the chicken and potatoes are roasting, prepare the yogurt sauce. Place the yogurt in a small bowl. Grate the garlic clove over the yogurt. Add the remaining lemon zest and the lemon juice. Season lightly with salt. Stir to combine. Serve the roasted chicken and potatoes with the arugula, yogurt sauce and fresh dill. Pre-heat oven to 400 degrees F. Lightly drizzle or spritz a baking sheet with olive oil. Add cubed squash to the sheet along with another drizzle of olive oil. Sprinkle with a light layer of salt, pepper, and garlic powder, based on taste preference. Roast at 400 F for 25 minutes on the center rack. At the 25 minute mark, pull out the oven rack, and add your fresh cranberries to the roasting pan. Return to the oven for 10-15 minutes or until the cranberries have started to soften and burst a bit, resembling really juicy craisins. Remove from oven and add a sprinkle of cinnamon (approx. 1/8-1/4 tsp depending on preference) along with feta and honey (sweeten to taste). Garnish with parsley for a burst of color and dig in while it's hot! 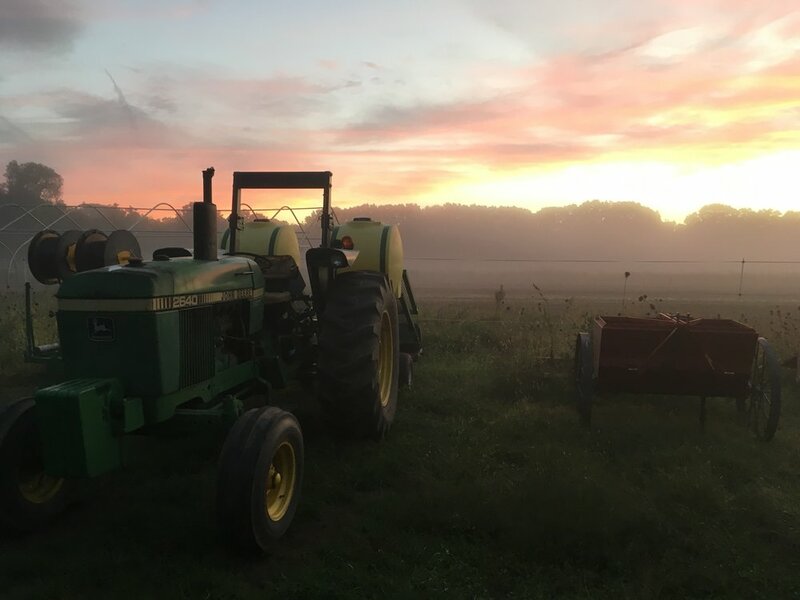 Fall on the farm is prime sunset photo season! Happy October! This past week it felt like we turned a corner on our to-do list. We have been laser-focused on addressing immediate needs for the current season, but last week it felt like we were finally able to carve out some time to prepare fields for next season. After bringing in the last bulk squash crate (an experimental crop of Honeynut squash, as well as decorative gourds), we mowed in the winter squash field and some older greens plantings, pulled up plastic mulch and drip tape, disked in crop debris and seeded 3 acres of Austrian winter peas and barley for cover crop. It always seems funny to tell people that as vegetable farmers, some of our favorite sights are mowed in crops and cleanly tilled fields, but for us it feels great to start fresh after a tough season (that’s one constant in farming - every season is a little tough, but always for different reasons!). Clean fields mean that we can seed cover crops, which are an important investment we make every year in the health of our soil. We may arrive in the fall feeling a little weary, but cleaning up the field and filling them with nutrient-replenishing cover crops fills us with optimism for the next year. Speaking of next year, we are planning to have CSA renewal forms ready next week! After this week, there are 2 weeks left in the Main Season CSA, and then another 4 weeks of veggies for the Late Fall CSA. Pie pumpkins - Also known as sugar pumpkins, you can use these for pumpkin pie, pumpkin bread, pumpkin soup and more. Cut in half, scoop out the seeds and roast until you can easily stick a fork through it. Scrape out the cooked pumpkin flesh, puree, and use just like you would canned pumpkin. Butternut squash - This classic fall squash is sweet and versatile. Great in curries, soups and risottos. We love to add it to chilli. Decorative gourds - We grow two gourd mixes (Autumn Wings and Daisy), as well as mini orange and white pumpkins. Not for eating, but the are great for decorating your table! Broccoli or Eggplant - Our broccoli has suffered from Alternaria this year, which has dramatically reduced yields and caused cosmetic damage to the broccoli heads. This is a disease that likes humid weather and is spread by rain - two things we’ve had plenty of! We have a second succession of broccoli that might not be as badly affected, but supply from our current planting is limited. Since we also have a limited supply of eggplant, we will be offering a choice between the two this week (after two seasons of eggplant bumper crops, this year was a bit of a dud, likely due to blossom drop in the extreme heat this summer). We will have most of the veggies listed in the CSA available as well as red kuri squash, buttercup squash, beets and decorative corn stalks. We won’t have corn anymore this season, but we do now have jack-o-lanterns from Verrill Farm. We’ve also got mushrooms from Fat Moon, honey from Double B (produced by bees right here on the property! ), and Silferleaf Farm’s raspberry jam and raspberry infused vinegar. Hopefully we’ll have more eggs from Pete and Jen’s back in stock later this week. Finally, we’ll be getting organic cranberries from Fresh Meadows Farm in Carver, MA at the end of the week! Rebecca topping our Brussels sprout plants to encourage sprout growth. Happy Fall! The official change of the season is evident in the fields this week. We are bringing in the last of the winter squash, the tomatoes have dwindled, and we are getting ready to dig sweet potatoes! The Main Season CSA is in it’s 17th week out of 20 weeks so there are 4 weeks left including this one to enjoy the fall harvest! The last Main Season pick up will be October 20th and then the Late Fall CSA will begin October 25th for those who have signed up. The farm store will continue to be open regular hours until October 27th. Between harvests we will be cleaning up fields no longer in use. This means pulling up plastic, rolling up landscape fabric, and taking down some extra fences in order to disk in plant debris. We like to get this done as soon as possible so that we can prep the fields to seed cover crop. The earlier we can plant our peas, barley, and rye the more it will grow this fall, and therefore the more protection it will provide for the soil over the winter months. That soil protection is particularly important during severe rainstorms (which we have had pretty frequently lately!) because it prevents our precious topsoil from eroding. Melissa and a junior helper check the rain gauge after last Tuesday’s storm - 2.5 inches! Delicata and Honey Boat Squash - These sweet squash have edible skin and are easy to slice up for quick baking. Transitional. Acorn squash - This is a great squash to stuff with a grain, veggies or sausage (see the recipe below for one idea!). Transitional. Potatoes - King Harry or Kennebec (both are white storage potatoes). Transitional. Winter Squash including: Red Kuri, Buttercup, and Spaghetti (all winter squash was grown in our Transitional field this year). Herbs - cilantro, basil, thyme, oregano. Hot peppers - Serrano and Fresno have the most. We will have most of the veggies listed in the CSA available as well as tomatoes, spinach, butternut squash, and broccoli. We will also have corn from Verrill (this will be the last week), honey from Double B honey (produced by bees right here on the property! ), and eggs from Pete and Jen's Backyard Birds. We are hoping to have raspberries again from Silferleaf Farm but if we don’t, we will still have their delicious raspberry jam and raspberry infused vinegar, which is fantastic on salads! The flowers will last until we have a frost so if you have bouquets left to pick now is the time! Flowers in bloom right now include zinnias, amaranth, orlaya, Sweet Annie, bachelors button, celosia, statice, verbena, cosmos, gomphrena, ammi, torch, and more. Original recipe source unknown, but it has been a favorite in Lise’s family for years! Put the cottage cheese through a food processor to make it smooth. Beat the mashed potatoes into the cottage cheese. Beat in the sour cream, eggs, salt and cayenne. Stir in the scallions. Spoon into pastry shell. Sprinkle with grated cheese. Bake at 425 for 50 minutes until golden brown. Heat oven to 375°. Cut a thin slice off round side of each squash half to create a stable base. Sprinkle with salt and pepper; coat with cooking spray. Place squash flesh side down on a baking sheet lined with aluminum foil; bake until golden and tender, 30 minutes. Remove from oven; flip squash and set aside. Heat broiler. In a large nonstick skillet over medium heat, heat 1 teaspoon oil. Add sausage; cook, breaking into coarse pieces, until brown, 6 minutes; transfer to a bowl. To same skillet, add remaining 2 teaspoons oil and leek; cook until leek is soft, 3 minutes. Add garlic; cook, 30 seconds. Add kale and toss; add broth. Cover and cook until kale is tender, 5 minutes; stir in sausage. Divide kale-sausage filling among squash. In a bowl, combine walnuts, Parmesan and panko; sprinkle evenly over squash bowls and coat with cooking spray. Broil until panko is golden, 2 minutes.